FOR EVENT PRODUCTION THAT WILL SAY WOW, we’re your team. VenueFind Group Conference & Events Management Team is a specialist team of conference and corporate event organisers across London and in worldwide locations such as Europe, South Asia, Middle East and USA with 17 years of event experience. Through the years VenueFind Group have ensured all our services are of the highest quality, whatever corporate event you are planning from incentives, conferences, meetings, product launches, gala dinners, teambuilding and award ceremonies our business is your event. From smaller meetings to international conferences, we always approach each job with the same commitment and professionalism. 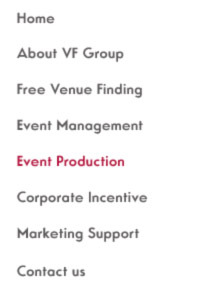 VF Group plays a pivotal role as a single point of contact managing an entire project or, if you prefer, just venuefinders are a few of our chosen services. One-stop event planning: Why waste time running in circles looking for individual event production services when you can make one call to VenueFind Group? We take care of everything from developing and delivering campaigns from concept all the way to the experience and evaluation, strategy, custom stage design and audio-visuals, to complete event logistics, and much more. Whatever event you are planning, VenueFind Group can take away the hassle of organising it, whilst delivering precisely the event you want, on time and in budget. VF Groups expert, friendly team offers a comprehensive service that takes care of everything, from initial concepts and venue sourcing to the complete organisation and coordination of every detail of an event – including, of course, its ultimate and successful delivery. Event production is one of our key business areas and something we are passionate about. Over the years we have become a highly respected and prominent player in the corporate and private event production industry. We set extremely high standards dedicating ourselves to help make you and your company successful. At VF Group, we are experts at creating out of the ordinary solutions to help produce memorable events, our event management team will work closely with you to refine and amend your programme as necessary until it is exactly right. VF Group helps you plan your event, design it, and deliver it. So when the big day arrives, you have an event planning company that can handle all the details, turns ideas into action and brings your audience to their feet. Please feel free to contact our events team at anytime for an obligation-free chat about any of your present or future event requirements.